In honor of the 25th year since his documentary “Roger & Me” first played, film maker Michael Moore donated the remaining profits from the film to Traverse City Film Festival (TCFF), which Moore co-founded in 2005. Nearly one million dollars of the proceeds from the sale of “Roger & Me” have already been granted to filmmakers, artists and media, and this last $250,000 donation, announced at TCFF’s 10th anniversary kickoff last week, is earmarked for something in particular. TCFF posted that the plan is to create a monthly “Mike’s Movie Night” across Canada and the US, where independent American, foreign and documentary films will be beamed to theaters. 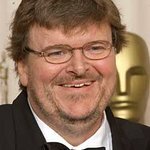 “[It’s] the way they are meant to be seen,” says Moore, “in a theater, in the dark, up on a big screen, with dozens or hundreds of other moviegoers sharing the experience.” Mike’s Movie Night will be hosted by prominent filmmakers and actors, with a live Q&A at the end of the film.